Whether used as a CBD salve for pain, for arthritis, for skin conditions, or simply to relieve dry and cracking skin on your hands, it always made an impact. This should not be understated. In a world where not all CBD salves are equal, you should stick this one up on a pedestal. It is a bit on the expensive side, but we think it is definitely worth it. It oozes quality and backs it up with performance. We’re already ordering more and you shouldn’t think twice about trying some yourself. Endoca is a premium name in the industry in Europe and has made its way to our own shores. While they label this product a hemp salve, it’s essentially a CBD salve with a different title. With a motto that reads “So Pure You Can Eat It,” we couldn’t help but check it out! Put simply, Endoca has a fantastic backstory. It all started with one man in Denmark who saw firsthand the pitfalls of pharmaceuticals and delved deeper and deeper into researching the endocannabinoid system. With Denmark historically having a more open approach to cannabis he set out producing CBD products to fund further research. Now the company employs over 100 people, grows over 2000 acres of organic hemp, and has a shipment center in Washington state. There’s even a non-profit Endoca foundation fighting for a better future with CBD and funded by the sales of their products. Endoca hemp salve is a topical product that provides localized relief. It comes in a 2oz or 30ml container. It’s a CBD salve, so the base will be in oil, in this case, coconut, imbued with 750mg of CBD. There is a longer list of ingredients that includes beeswax, lemon peel, vanilla, vitamin E, and several others. 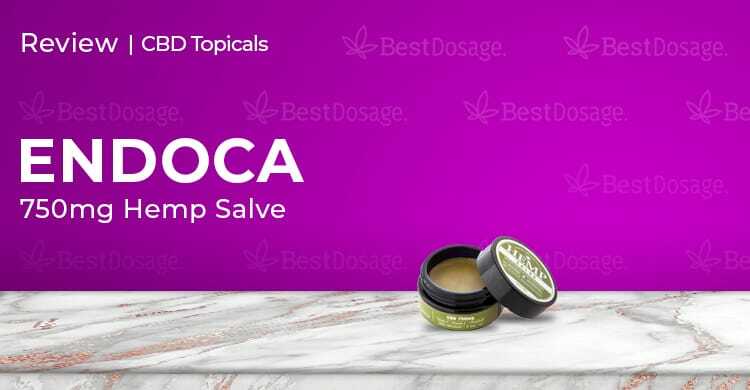 Endoca claims that their hemp salve contains anti-aging properties. We don’t doubt that, as CBD has been shown to help with so much, but it’s the first time we’ve seen a company come out and say this. As with any CBD salve, it is supposed to help with pain relief, skin irritation, and other ailments. This product is made from 100% natural, organic, and even food grade ingredients. Hence the claim that you can eat this product just as well as putting it on your skin. It is notable that Endoca encourages the customer to also use it on their skin, which shows how much faith they have that the general public won’t have a negative reaction to it. At this point, we’ve tried a number of different CBD salves and read plenty of CBD salve reviews too. This was our first review of an Endoca product, however, and it certainly made a great first impression. The container itself was thicker than we were used to and gave the impression of a high-quality product inside. The packaging was informative and straightforward. Nothing overly exciting, but it was professional and had a nice hemp theme all the way around. Unscrewing the lid, we were met with a nice light fragrance of coconut and vanilla. Most people are going to like this scent, but I happen to not like the smell of coconut so much. Thankfully, it wasn’t at all overpowering. The color and texture of the product inside seemed very organic, for lack of a better word. In short, this CBD salve felt more like something you would buy from a boutique shop, rather than just trying to buy CBD salve online. Certainly, it made us very comfortable to dive in and experience the hemp salve itself. This is a CBD salve with a nice amount of CBD in it, so you can definitely try just a little at first. In fact, Endoca advises that, even though their topicals contain 100% natural ingredients, you start out by testing it on a small portion of your skin. Once you see that there aren’t any adverse effects, and we haven’t read any CBD salve reviews for this product where someone had an adverse effect, you can feel free to spread to other areas. It seemed to us that this hemp salve lasted a long time, somewhere between 6 and 7 hours was the average. After you feel the impact of the CBD salve lesson, feel free to add a little more to the area you are treating. The initial effect for just about everyone was that of soothing. It just felt so good on our skin! You may say that is typical of a CBD salve, but this particular one felt a step above. It’s true that I personally didn’t love the coconut smell, but the feeling more than made up for that and the smell dissipated rather quickly anyway. While this product definitely was intended as a hemp salve for pain relief for some, there were actually a plethora of ailments we were trying it out for. In terms of pain, there was an almost immediate relief for more minor aches and pains. None of us was treating acute pain, but we got the sense that it might not be enough for that. It was great, however, on dry and irritated skin. It’s a very sensitive CBD salve, so we just lathered it on everywhere and let it do its thing. A few of the team members were hoping to find it would lessen the arthritic pain in their joints and were blown away by just how effective it was. The same goes for the one person who was suffering from psoriasis. We haven’t really seen a CBD salve deal with a chronic skin condition so quickly and thoroughly. It was, in fact, quite impressive. CBD (cannabidiol), Coconut Oil, Beeswax, Cannabis Sativa Seed Oil, Citrus Medica Limonum (Lemon), Peel Oil, Citral, Vanilla, Vitamin E.
First of all, we recommend just hopping on their site and using the live chat function. We were always able to find a rep available within minutes, and they, surprise surprise, weren’t robots! When we look to buy CBD salve online, we don’t ever expect such knowledgeable reps to be available on live chat. Such a refreshing experience! Of course, you can also reach them via email and phone, but we never saw the need to. Endoca ships across the United States out of their facilities in Washington. They charge a flat rate of $7 per order for standard shipping that comes via UPS or USPS. There are express options too that cost more, but we have to say we were pretty happy with their standard shipping. The Endoca salve 750mg product most definitely surged toward the top of our list. When looking for a CBD salve, it really does have everything you need. Sure, the coconut smell doesn’t work for everyone, and we also found it to be a bit greasy unlike a CBD cream or CBD oil balm, but you can’t argue with the results. Every single person on our team found help in alleviating their symptoms. If the greasiness is a bother, you could always stick to applying it before bed. For us, it really wasn’t that big of an issue.